Kuriyma - W Heavy Duty PVC Multi-Purpose Suction Hose 4 in. X 100 ft. OD 4.76 in. 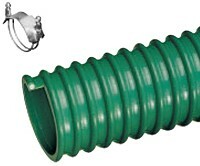 • Green PVC convoluted construction - provides flexibility. • Smooth bore construction - allows unrestricted flow.